Loyal salesclerks Sandy Heil and Claire Hearst.It’s Christmas time, Grandmother’s birthday, George’s graduation, your parents’ thirtieth anniversary, daughter Amy’s job promotion – any occasion where the purchase of a meaningful present or celebration card is in order. Where do you go for help? Norsdstrom’s, or Macy’s? Maybe. Do these and other large outlets provide comparing and contrasting many different items, varieties, values, types, and sizes? Do they encourage you to deliberate about “… that certain something he or she would really like but don’t know what it is?” Do those stores have a large array of delightful-looking greeting cards with messages that express “…exactly what I’d like to say?” No? Well, why not consider a multiple product-packed place like a gift shop specializing in unique presents and cards for all occasions? Why not have someone assist you by searching the vast outlets of the Internet? 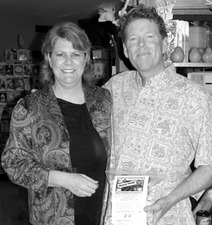 Why not visit the now 7-year-old San Clemente-based Cardvarks, the “impossible dream” of the Moxleys, entrepreneurs Frank and Heather? Evidence of this San Clemente business couple’s experimental nature is that you can not only buy countless items from Cardvarks, but, through them, you can now also sell anything from the kitchen sink to your pre-owned Hummer. In 1995, the duo started selling gift items and greeting cards at the Orange County Swap Meet. 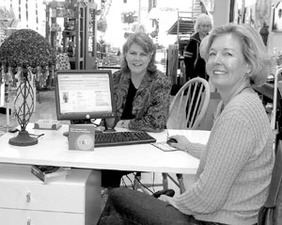 They began with one space, added another, and, by the time they opened a third space, they had four employees. “It took us three hours to set up and another two to take down,” said Frank. We decided, instead, to find a warehouse-showroom, with reasonable rent, open to the public seven rather than two days a week.” Fortunately for all of us, they chose San Clemente. It didn’t hurt that Frank was, and still is, a dedicated surfer. As a consignee for eBay customers, Cardvarks assists those who may not have the time, inclination, or experience in placing items on eBay and selling them via electronic auction. “People may have a treasure trove of things taking up space in closets, basements, and garages that could be cleaned out and sold on eBay,” Heather indicated. Over the past six years, the entrepreneurs have successfully marketed over 2,000 items via the Internet. Their new flyer suggests a number of possible sale items: antiques and collectibles; designer clothes, shoes, and accessories; electronics, including cameras, computers, PDAs, DVD players, and cell phones; professional digital photography equipment, entertainment memorabilia, jewelry and watches; event tickets for sports, theater, and concerts; even vehicle parts and accessories. What’s the procedure? You bring something into the store you want to sell. Cardvark’s staff review it with you, help evaluate or determine what the value is, conduct research if necessary, note particular characteristics of importance, the vintage, any specific descriptive notes that need to be made, whether or not it was owned by George Washington or Michael Jordon. One or more digital pictures are taken, and the copy, printing, copyright, whatever has to be accomplished, are submitted for eBay auction. Once an item sells, it is carefully packaged and sent to the winning online bidder. The auction usually takes about ten days and, once a product is paid for, including postage, Cardvark deducts a commission, usually 30% for items less than a thousand dollars, mails out the item, and sends a check to the customer. Another innovative Cardvark product idea came about after Frank had burned discarded lemon tree wood in his fireplace. Frank now has ten meat-gourmet stores doing very well with the product, which helps sell their higher grades of meat. Places like Beef Palace, El Toro Meats, and locally, Billy’s, are already among their clients. He intends to attract equally sophisticated stores in other metropolitan areas throughout the country for the wood chip line. As far as their busy gift shop is concerned, greeting cards are the most popular, as are the colorful rugs that look like surfboards, Hawaiian and beach décor items, home bar pub signs and beach scene framed photographs and paintings. The Moxley’s future plans include expanding custom cards and personalized stationery to cover any type of greeting occasion, more photographs and paintings by local artists with signing opportunities and probably a few new secret happenings we’ll have to wait for. With varied personal backgrounds, Frank a former trucking executive and dispatcher at Reagan Airport in Washington, D.C., and Heather a USC graduate in Communications and former Personal Director and Jane Fonda fitness video distributor, watch out for more entrepreneurship.